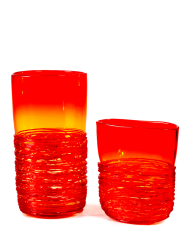 Our glassworks was established in 1967. 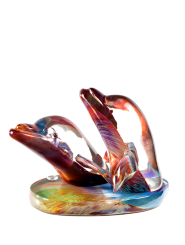 The aim of the company's founding associates was to market Murano-made glass art and to give complete freedom to master glassmakers to express themselves fully, thereby transforming their showrooms, now famous around the world, into an international level gallery for glass art. 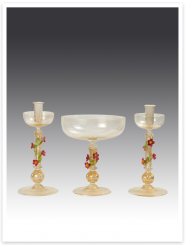 From the very beginning, the philosophy adopted by the company was, as it still is today, to have direct contact with private clientele so as to raise the standards of quality of our products, thereby adding to the growth of both our company and our master glassmakers. Through the collaboration of master glassmakers such as A. Barbini, A. Seguso, L. Seguso, L. Rosin, P. Signoretto etc., who made important contributions to the last century and who are still doing so to the history of glassmaking – a history that has lasted for more than a thousand years on the island of Murano – and because of targeted marketing operations to promote our company, we have always been present in artistic milieux and the interior design sector. Internationally renowned painters and sculptors such as Yoko Ono, Ben Vautier, Fernandez Arman, Ugo Nespolo, Luciano del Pezzo have forged their works in our ovens. In 2003, the American artist Fred Wilson, who was commissioned to set up the American pavilion at the Venice Biennale, had his works produced in glass in our glassworks from his designs which received rave reviews from the specialized press. Moreover, it is with great pride that our company has produced lighting fixtures, glassware and sculptures, made according to the thousand-year old standards of Murano art glass, which have been purchased by Paul Newman, John Travolta, Jack Nicholson all of whom are authoritative members of the political and cultural world.